Undoubtedly, the retail industries busiest time of year is Christmas and Wyevale challenged us to help them increase revenue during the festive months. Wyevale customers see their garden centres as places to explore and indulge their passions, choosing products driven by their own personal taste and style. This is amplified when customers shop during the festive period. This insight helped us to recognise that Christmas is personal. So we got customers to think about themselves through the lens of Christmas and excite their self-curiosity, in order to discover their Christmas personality. 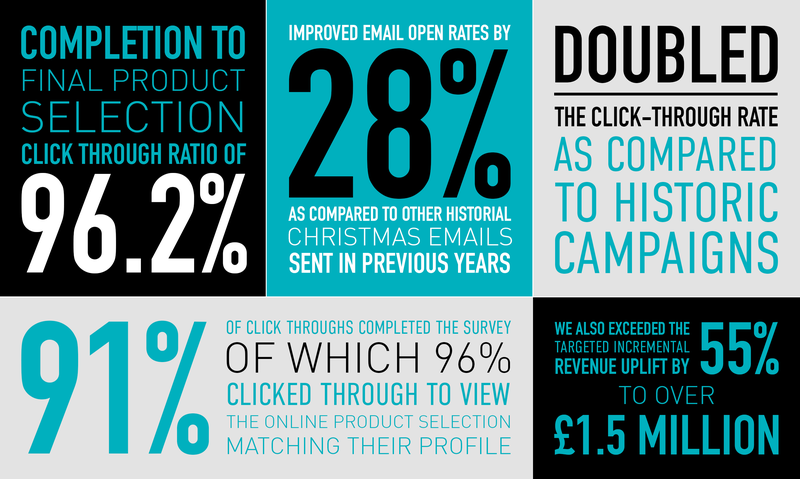 We invited customers, through a personalised email, to take an online quiz and choose their ‘Christmas Style’. At the end of the quiz customers we’re presented with their Christmas Personality such as Wintry White, Vintage or Merry & Bright. Christmas products that matched their Christmas ‘profile’ we’re also shown, inspiring them to purchase. It did the job too, as 90% of customers who finished the quiz clicked and viewed their individual product selection.